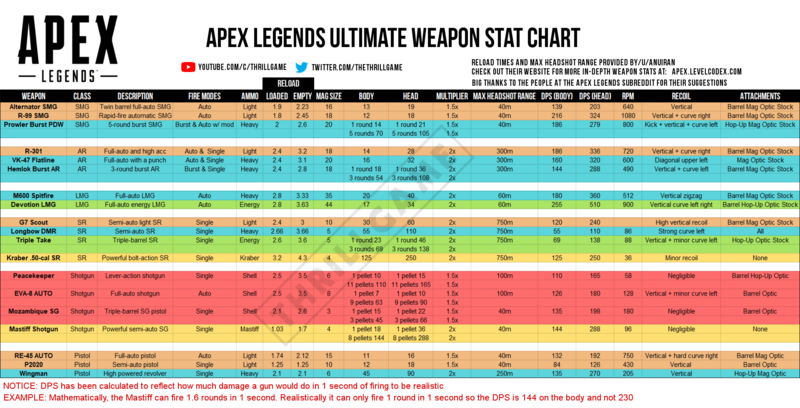 Apex Legends has only been out for about a week, so this weapons chart might give players a better understanding of the game’s gun mechanics. Apex Legends came out of nowhere. Literally. A little over a week ago, there were rumors flying around that EA flew out a bunch of streamers to play a new free to play battle royale title that they would stealth announce and release the following Monday. Well, all of those rumors turned out to be true and Apex Legends is now taking over the video game world with already over ten million players. The game has been dominating on Twitch since its release and many players have loved what they have played so far. They have loved it so much, that they have even charted all of the weapon stats in the game to give a better understanding of how the gun mechanics both work and how much damage they do. The Reddit user “ThrillGame” posted a weapons chart that gives an in-depth analysis of all of the weapons that are available to pick up. As you can see in the chart below, everything is listed from the different firing modes that are available for that gun, how much damage the weapon does to certain areas of the body, all of the attachments that are compatible with that certain gun, and even how the recoil will affect your fire. If you are looking for the ultimate chart to give you a better idea of the gun mechanics in Apex Legends, look no further. As someone who has lost touch with the battle royale genre, this game has revitalized that feeling that I first had when I couldn’t stop playing PUBG. However, Apex Legends has been a much more polished experience from the start. Yes, I do know that some people have experience crashes and stuff. But I have still yet to run into any issues. On top of that, the team based gameplay is the total mixup the battle royale genre really needed and the game makes communication incredibly easy even without a mic due to its ping system. I know it just released, but I think this game is going to be successful for quite some time. Apex Legends is currently available for free on PC, PS4, and Xbox One.